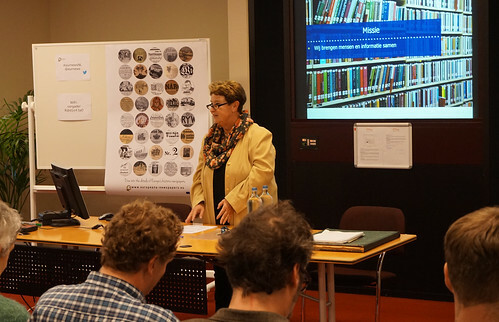 On Tuesday 28 October 2014, the Europeana Newspapers Information Day took place at the Koninklijke Bibliotheek, National Library of the Netherlands (KB) in the Hague. 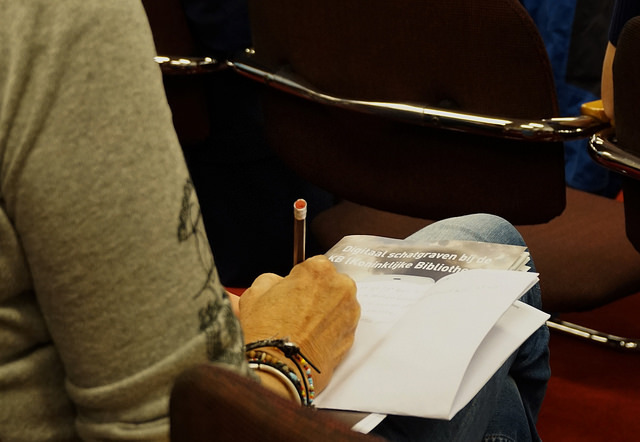 Among our audience were over 40 librarians, archivists, representatives of educational and cultural institutions, as well as professional and amateur researchers; in short, a diverse group of end users interested in historical newspapers. 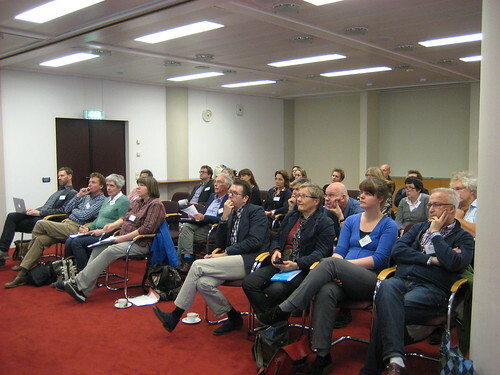 The audience was very active, which led to interesting discussions throughout the day. 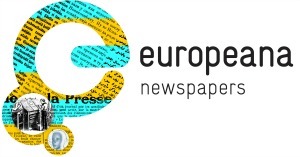 The programme included presentations about the digital newspaper collection of the KB, about the Europeana Newspaper project in general and about the newspaper browser by The European Library in particular. 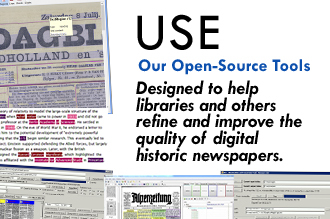 Moreover, two academic researchers presented their approach to newspapers as a source of historical information and what they thought was the added value of combining the European newspapers in one portal. Dr. Els Van Eijck Van Heslinga, the KB’s Director of business operations. The Information day was opened by Dr. Els Van Eijck Van Heslinga, the KB’s Director of business operations. She introduced the Europeana Newspaper project and made clear that participating in these type of projects is very important for research libraries such as the KB and adds value to their collections. Moreover, she made clear how the new browser (accessible through The European Library) which was developed within the project, made it so much easier and attractive to do transnational comparative research. The next presentation was by Huibert Crijns, Collections specialist at the KB. He described the efforts of the KB in digitizing Dutch language newspapers residing in a large number of institutions in the Netherlands. The collection of digitised content is available through Delpher. Dr. Samuël Kruizinga, embedded researcher at the KB and Associate Professor of Contemporary History at the University of Amsterdam, made clear how he makes use of historical newspapers in his current research project, which focuses on the memory of the First World War in the Netherlands. He pointed out that newspapers are a rich source of information, because they contain all kind of ’hard’ data such as financial, legal, commercial and social information as well as information about ‘public opinion’. Kruizinga further stressed that it remains crucial to establish the position of a certain newspaper and its readers to be able to interpret its content. Dr. Pim Huijnen, Postdoctoral researcher in the Translantis project at Utrecht University. Dr. Pim Huijnen, Postdoctoral researcher in the Translantis project at Utrecht University, proceeded by illuminating the ’digital turn’ in humanities research. 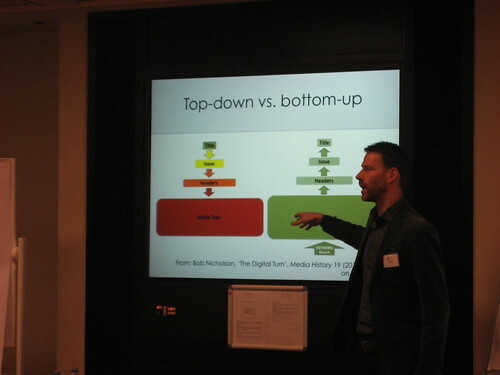 He clarified some of the practical aspects of using digital resources and the ’bottom-up’ approach, i.e. browsing large full-text corpora by means of keywords. Pim Huijnen pointed out that the method of ’distant reading’, typical for digital humanities and increasingly popular because of the availability of large digital collections, is not enough in itself to answer humanities research questions. 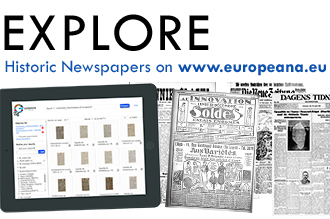 However, the use of online newspapers collections such as Europeana Newspapers offers great opportunities to start looking for patterns and developments over time or within different geographical areas. Lotte Wilms, Project leader European Projects at the KB and Work package leader for Europeana Newspapers, gave a detailed description of the work performed within the Europeana Newspapers project. She explained the process of aggregation and the different tasks related to refinement. Marieke Willems, Communication Officer EU Projects at LIBER, presented the newspaper browser which was developed within the project and is now available through The European Library. She gave a live demo of the browser and performed a number of queries to show the opportunities for end users. 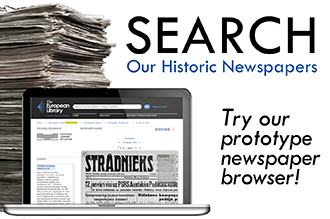 See http://www.theeuropeanlibrary.org/tel4/newspapers for the browser. It was an inspiring afternoon and we are very happy with the recommendations provided by the participants. The official report is available here. This entry was posted in Information Day, News and tagged information day, KB by eurnews. Bookmark the permalink.